A southern pied babbler on lookout duty in the Kalahari desert, South Africa. Parents of millennials still living at home aren’t the only ones with children that refuse to leave. Many animal species have adult offspring that are slow to take flight, but when and how they leave has been poorly understood by scientists. Now, new UBC research on a desert-dwelling African bird is yielding some answers. 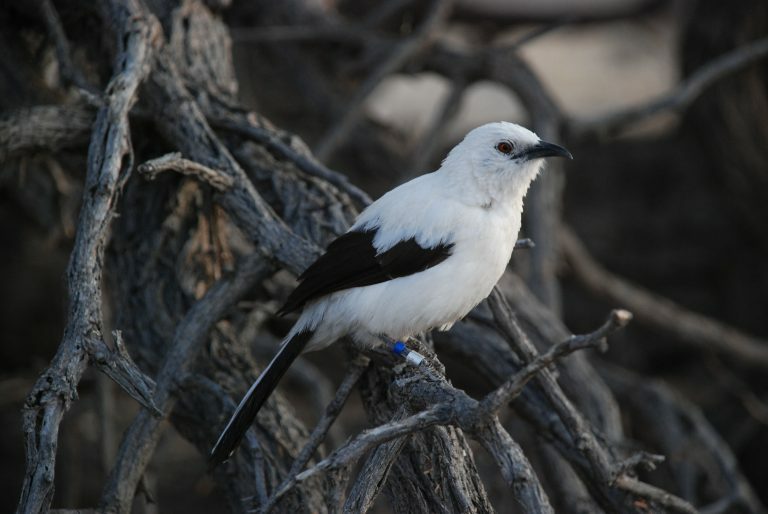 Martha Nelson-Flower, a postdoctoral fellow at UBC Faculty of Forestry, studied the behaviour of wild southern pied babblers, which live in family groups of up to 14 in the Kalahari Desert in South Africa. Her findings, published in the Journal of Animal Ecology, suggest that better prospects elsewhere, as well as family dynamics between brothers and stepfathers, play a big part in determining when offspring disperse. A southern pied babbler perched high in a dead tree in the Kalahari Desert, South Africa. A dominant female southern pied babbler on lookout duty, South Africa. However, a male’s position in the group social hierarchy made a big difference to their decision to disperse. Brothers queue for an opportunity to inherit the leadership of their group, or that of a neighbouring group; by leaving early, younger brothers could boost their queue position and improve their prospects. Intriguingly, males with step-fathers also left early, likely because step-fathers prioritize their own, younger sons in the queue.